Hangman guess the hidden words. Click the letters and see if you find them. 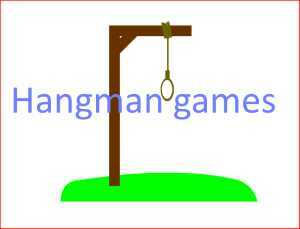 You have many name hangman game, classic to play completely free online. The essence of the game is to guess table words hidden in asterisks. Challenge to a duel to your Intelligence Apart from spending time entertaining help us to exercise your memory by learning new words with this a favorite game of generations. It is the traditional and the rules are easy Guessing words, you have to choose one of the alphabet, if you mess will emerge sticks then finally the rope and hanged doll..